VANCOUVER, BRITISH COLUMBIA, CANADA, January 11, 2017 /EINPresswire.com/ -- Vancouver, Canada / January 11, 2017 - Nexus Gold Corp. (TSX-V: NXS, OTC: NXXGF, FSE: N6E) announced it had received geochemical results from Actlabs Burkina Faso SARL, an ISO 9001:2008 certified independent lab, from its initial exploration program at the Niangouela Gold Concession located 60 kilometres north of Ouagadougou, Burkina Faso, West Africa. The highlights of the program include sample NG005 taken from the primary quartz vein at 46 metres below surface which returned a value of 2,950 g/t gold. In addition, sample NG006 was collected from the artisanal dumps of the sheared intrusive which returned a value of 23.9 g/t gold. These results indicate the presence of high-grade gold occurring within the primary quartz vein and the sheared intrusive envelope. These samples were selected and may not be representative of the mineralization hosted on the concession. Results from the 802-metre RAB drilling program included an intersection from hole 19 proximal to the primary quartz vein which returned 1.05 g/t gold over 12 metres. Conducted in a broad grid pattern and designed to test the orientation and strike length of the primary quartz vein, the RAB program also set out to identify any potential off shoots or splays which may be associated with this primary structure. To this effect, the program successfully identified a secondary anomalous gold trend striking to the south west at an oblique orientation to the main east-west striking quartz vein. 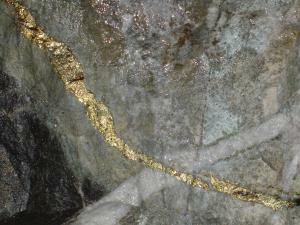 This 500-metre feature was identified by mineralized intersections occurring in holes 4, 13 and 15, which returned anomalous gold values over three metres respectively. All holes in the program were drilled to a depth range of 18 to 46 metres testing the saprolitic rock (soft rock) which sits at the top of the stratigraphy. Readers are cautioned that the above reported widths are drill intersections and not true widths. The overall RAB drilling results indicate the gold bearing nature of the primary quartz vein. This vein has now been identified in trenches, artisanal workings and RAB drilling, extending over 1km (1000m) in length. It remains open in all directions. "We are extremely pleased with the first round of exploration work at Niangouela," said President and CEO, Peter Berdusco. "We were able to verify the presence of high-grade gold within the primary quartz vein and the sheared intrusive. The RAB program accomplished the goal of establishing the initial size and scope of the quartz vein. We were able to determine not only an extended strike length, but also identify a secondary mineralized trend. This information creates a compelling road map for us that will guide the next round of drilling, allowing us to begin to test some of the newly identified priority target zones." "Given the initial width and strike length of the primary quartz vein, coupled with the very high-grade gold results from both the vein and the sheared intrusive that hosts it, this presents a very exciting exploration target," said Senior Geologist, Warren Robb. "Our next step is to verify gold mineralization at depth and along strike." The Company employs a QA/QC program of inserting standards, blanks and duplicates into the sample stream as a supplement to the internal checks employed by Actlabs. The 178-sq km Niangouela Gold Concession is located on the Boromo Greenstone Belt, same as the Company's Bouboulou Gold Concession, and is proximal to the Kalsaka deposit and the Sabce shear zone. It is road accessible and has one major orpaillage (artisanal workings). Historical exploration at Niangouela consists of 556 pits and 11 trenches, with numerous rock and soil samples. Previous programs have identified a zone which runs ENE and WSW occurring in the south central part of the concession. This zone has returned gold in soil samples up to 34 g/t Au, rock samples have returned values up to 18 g/t Au, and trenching has returned values of 4.85 g/t Au over 10 meters. Historical assays of 5.93 g/t Au, 4.83 g/t Au, and 4.12 g/t Au over sample lengths of two metres respectively have been returned from trenching over the vein. A qualified person has not taken steps to verify this data.